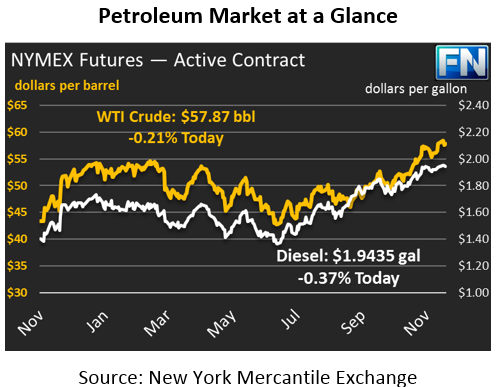 Oil markets managed to eke out some gains yesterday despite trading lower for most of the day. Light volumes have kept prices from gyrating too significantly. Crude picked up a meager 13 cents yesterday, but gave up those gains and more overnight. Currently, crude prices are trading at $57.87, 12 cents below yesterday’s close but still a penny above Tuesday’s opening price. Diesel markets also picked up a few points, ticking up to close at $1.9507, a gain of 0.1%. Today, diesel prices are on the downward mend, propelled by a larger than expected diesel stock build despite continued strong demand. Prices are currently trading at $1.9435, down 0.7 cents (-0.4%). Gasoline prices were the outlier yesterday, falling by a significant 1.9 cents (1.0%) despite a reported stock draw. The price movements yesterday were truly bizarre given that the only product to show declining inventories was also the only product that lost value. Gasoline prices are ebbing higher today, currently up 0.1 cents to $1.7730. The API’s report was quite a surprise to a market that was confident in a sizable crude stock draw. Cushing, OK stocks, the source-point of WTI crude oil, saw a draw of 3 million barrels (MMbbls), in line with the trade’s expectations. However, the rest of the country saw lower demand, leading to an overall build of 1.8 MMbbls. Gasoline and diesel stocks were both expected to rise marginally, but the notable gains in diesel stocks eclipsed gasoline’s draws. Markets are beginning to get nervous leading up to the conclusion of OPEC’s meeting tomorrow. Goldman Sachs analysis showed that the downside risk outweighs the upside risk going into the meeting. OPEC tends to have a bearish bent when analyzing market data, so they are more concerned with burgeoning OECD inventories than other countries. OPEC sees OECD stocks at 150 MMbbls above the five-year average; the IEA believes the excess is only 119 MMbbls. Countries like Russia could look to the IEA and be less concerned with an extension. GS also notes that markets have already priced in a $2.50 premium assuming the extension passes, meaning prices likely will not rise much higher if OPEC announces an agreement.